Guidance for colleges and training providers on how technology can add value to assessment and feedback. Colleges and training providers across the UK are looking to technology to improve the effectiveness, efficiency and flexibility of their assessment and feedback practice. In a digital age, it is important to take advantage of what technology can bring to assessment and feedback. 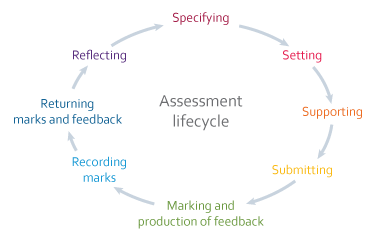 Our assessment and feedback lifecycle model captures the elements or stages across any assessment or feedback activity, from a short quiz to a final assignment. You can find out more about each stage, and how technology can help, in our detailed guide where you can read an overview as well as explore individual areas of the lifecycle. Teachers and trainers often innovate with technology at the 'supporting' stage of the cycle, for example in formative assessment. However, technology offers equal benefits in the management of assessment: our pages on submission, marking and production of feedback explain more. Key to our understanding of technology-enhanced assessment and feedback is that it extends or adds value to the strategies, processes, procedures and systems used throughout the assessment life cycle. So we use the term technology-enhanced assessment and feedback in this guide rather than e-assessment (which can sometimes be understood as onscreen testing) to highlight that technology can add value to assessment and feedback in many different ways. You may also want to know more about electronic management of assessment (EMA). EMA refers to technology used to support the electronic submission, assessment of, and feedback on, assignments. Find out more from our introductory guide to EMA. Our quick guide to improving student assessment provides a useful round up of our research into technology in assessment and feedback that has underpinned this guide for FE and skills. Further education (FE) and skills covers a wide range of courses and qualifications with markedly different cultures and approaches to assessment and feedback. Our e-assessment survey report (pdf) published in May 2016 researched use of e-testing, technology-supported formative assessment, e-portfolios and tracking systems across the sector. From this, we know most FE and skills organisations are using technology in assessment on a day-to-day basis, but the impact is limited. Only just over half (56%) of organisations have a strategy for technology-enhanced assessment. This makes widespread adoption of technology-supported assessment harder to achieve. 57% have had a good or very good experience of e-assessment but the digital capabilities of teachers and learners were still a barrier. Financial constraints and time for training and support are also concerns. So too are cultural issues; let’s face it, it’s often easier to stay as you are than make changes to something as important as assessment. Nonetheless, where technology is combined with support and training for staff, assessors and learners, organisations report significant transformative benefits. These benefits need to be shared more widely. Produced in conjunction with our FELTAG partners, our 2016 report on the evolution of FELTAG, captures a picture of a sector in the process of change. Nonetheless, over half of respondents felt their organisation’s staff lacked digital literacy, and a similar number in the 2015 City and Guilds training provider survey (pdf) spoke of the need for training in e-portfolios. Listen to our interview with Jayne Holt, assistant principal for learning services from Walsall College, on how they are using technology to meet challenges and provide a quality experience for their learners. With many organisations in our survey (pdf) expecting to increase technology-enhanced assessment and feedback by 2020, it is vital to know how to use it well. Bringing teachers and learners together to work on digital literacy is a great way to start. Our research tells us that learners need assessment literacy (ie understanding of, and engagement with, the purpose of assessment) as well as digital literacy. Working together can help learners understand assessment processes better and enable teachers to see assessment from the learner’s perspective. ISA Training in south Wales involves trainers, assessors and learners in digital literacy training sessions. Read our case study (pdf). Make time for upskilling staff and learners in digital literacies. Even today’s learners need support with using technology in learning; often it’s a matter of confidence, sometimes it’s just shortage of time, but inability to use a technology effectively means its value is lost. In the section on learning analytics, our guide to EMA explains how the data collected in EMA systems can help you spot learners in need of support. Some organisations have invested in bespoke systems. Larger colleges working with many different awarding and accrediting organisations are more likely to need to develop their own in-house solutions. Bedford College, a large FE college, developed an in-house EMA tool to track progress against BTEC, City and Guilds and A/AS level qualifications in a single system fully integrated with Moodle. Establishing 'digital-as-the-norm' can also be key to changing an organisation’s practice. Before implementing end-to-end EMA systems, Walsall College ensured all staff were 'tech-savvy'. South West College, Northern Ireland, prepared for online delivery and assessment of courses by closing the college for one week. Change requires strong leadership and clear evidence of benefits for the organisation, its teachers and learners. Our guide to managing an EMA project explains more. In a fast-changing world, teachers and trainers with knowledge and experience of technology are better placed to respond to curriculum change. Using digital tools in their own continuing professional development (CPD) can give staff a head start. Watch our video on CPD with e-portfolios at Thanet College. Portland College, an independent specialist college, has used iPad minis to document learners’ progress in independent living skills. Read this among other case studies (pdf) in our report on technology for employability in FE and skills. Effective use of cloud services and storage for e-portfolios can also prove beneficial for learners and teachers with time constraints. This benefit is felt particularly in work-based learning and apprenticeships. Apprentices at Barnsley College on level 3 and 4 diplomas in digital learning design use Google Sites as an e-portfolio tool. Social media can prompt a richer dialogue around developing work while also improving learners’ employability. Learners using blogging and networking tools, for example, can obtain feedback from experts and potential employers through online links to their work. BTEC media production students at Basingstoke College of Technology gain a head start through continuous engagement with feedback from peers and industry professionals. Online assessments can be more accessible for learners and cost-effective for organisations (although accommodating large groups of learners can be problematic). Those benefitting especially are learners in dispersed workplace environments. However, the potential is greater than is often realised; don’t just assume e-testing means multiple choice questions, as the BTL and City and Guilds case study (pdf) on functional skills reveals. It is important to take a principle-based approach to assessment and feedback to understand and articulate what good practice is before seeking out technologies to use. Our guide explains more. For most learners, technology-enhanced assessment and feedback offer more benefits than challenges. However, some learners lack confidence in using technology in assessment and many more lack understanding of how to use technology effectively to evidence their learning. Improving the digital capabilities and literacies of learners remains a high priority for FE and skills providers. Our detailed guide provides models, ideas and resources. Many would argue it’s in the rich variety of assessment-for-learning techniques that technology really comes into its own. By using quizzes, apps, online polling tools, and by capturing digital evidence in the form of audio, video and image files, learners gain control over their own learning and are motivated to work independently. GCSE English resit learners at Loughborough College test their knowledge and understanding on their own mobile devices using the language learning app, Memrise. Using e-portfolios, learners can assemble their own evidence against assessment criteria, providing assessors and employers with a richer picture of who they are, and what they can do. Selecting and presenting evidence for e-portfolios brings in additional skills of communication, presentation, evaluation and decision-making, all of which add value to learners’ employability. Students of art, computing, business, media, sports therapy and education from levels 1 to degree level are among those benefitting from Swindon College’s introduction of Mahara e-portfolios. Research shows that bringing your own devices (BYOD) is a powerful way of engaging learners in formative assessment. Read more about the issues and benefits of BYOD. We continue to support our partners in the FELTAG coalition to advance the use of technology in learning, teaching and assessment. Please contact your Jisc account manager or senior co-design manager Lisa Gray lisa.gray@jisc.ac.uk to share your examples of effective practice. I am a consultant author on e-learning and assessment. My publications for Jisc include effective assessment in a digital age (2010), effective practice in a digital age (2009), effective practice with e-portfolios (2008) and designing spaces for effective learning (2006). More recently, I have worked on online guides for Jisc including getting started with e-portfolios and using technology to improve curriculum design, including numerous case studies in print and on video.